Please make sure your measurement is exact. Do not add or take off extra inches to make sure your garter fits. All garters are made smaller then the actual size for a snug fit. All you have to do is provide us your exact measurement/size. The keepsake garter is hand embellished with a rhinestones and pearls and center with a blue rhinestone. 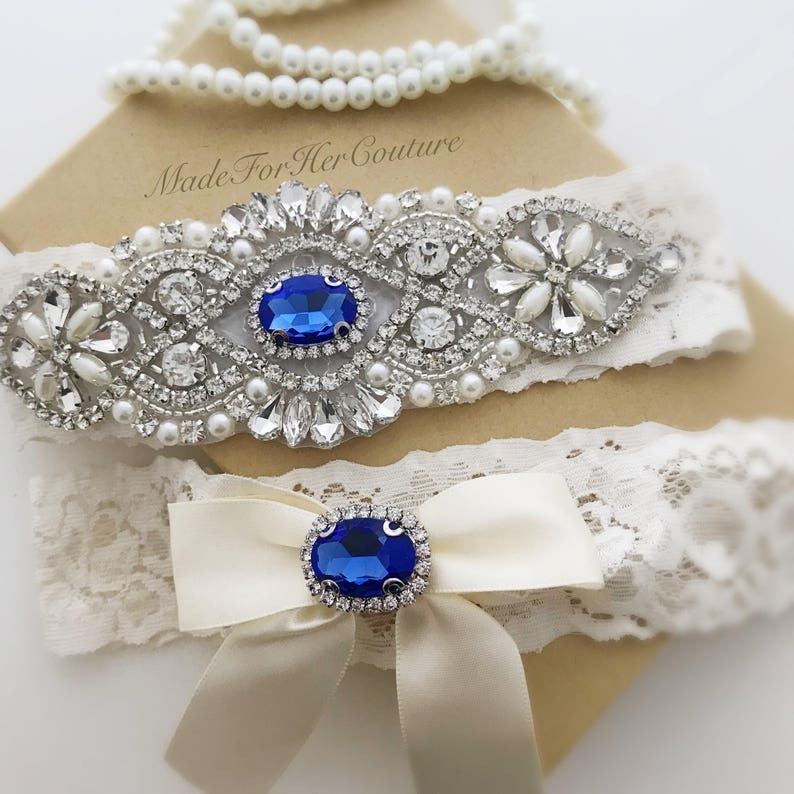 The matching toss garter is embellished with a simple yet elegant bow and blue rhinestone jewel surrounded by elegant rhinestones. The center of both the keepsake and toss garter is adorned with an elegant blue jewel--for the "something blue"! Quality is our number one goal so we use high quality, soft stretch lace for both the keepsake and toss garters. The 'garter box' option available upon checkout is a custom fit, kraft colored jewellery box. It is the perfect size to keep your garter safe until the big day! It is not a keepsake box which are at least 10 times the cost. Those will be available soon! We have recently switched our royal blue center stones. They now come with claws that holds that stone and prevents it from falling off. Pictures will be uploaded soon. ***All keepsake and toss garters will be made using the same width lace to avoid color or style conflict. The Keepsake lace measures approximately 1.5” (inches, as pictured). All toss garter lace measures approximately 1” (inches) wide. I welcome your creativity! Please message me for custom orders and I will be happy to accommodate. Select your thigh measurements in the dropdown box at checkout. To measure your thigh, place a soft measuring tape 4-5” (inches) above knee or as desired. Alternatively, you can use a piece of string, make the measurement and place that string against a ruler to get your measurement. I need this exact measurement. It is very important the measurement is done standing up to ensure maximum accuracy. Please do not take off or add anything extra, I will take in the appropriate amount to ensure a comfortable and secure fit. The toss garter will be made according to the same measurements as the keepsake. Upon checkout, there is an option to select rush shipping with appropriate processing time. If faster shipping is required, please contact me and I would love to work with you to ensure timely delivery. Get 10% off your order when you spend $29 at this shop. Discount shown at checkout. This garter is very pretty but the elastic isn't substantial enough to hold up the considerable weight of the rhinestones. Even though I provided measurements as requested, I still had to take it in an additional 2" to get it to stay in place. Very pretty though! Products are shipped in 1-3 business days (not including weekends or holidays), often sooner, after payment is received. If you require a rush order, please upgrade your shipping to rush order for an added $8 upon checkout. Also, please contact us through direct conversation/Etsy messages if this option is not available for your order. Due to the unique and handmade nature of our products, no 2 items will be exactly same. Please read the SHOP ANNOUNCEMENT for any production delays. Please let me know the date (in the ‘comment to seller’ box when checking out) when you need the item so I can assure it arrives in a timely manner and advise you the best shipping option if needed. My order is sent to my old address or I mistakenly provided the wrong address. What should I do? Please send us a convo before your item is shipped. We can cancel the transaction and you can place a new one with the correct address. If the item is shipped and marked delivered, you will be not be eligible for refund or substitute. If your order returns to our return address, the customer is responsible to pay re-shipping costs plus $5.00 handling fees. To avoid such issues, please double check your address before placing your order. If the garters arrive in wrong size, please contact me within 2 business days with a digital picture of the garter attached to your message. Please take picture of the garters next to a ruler so we can see the measurement. If the measurement shows that we sent you a wrong size garter we will send you a new one. ===> MadeForHerCouture WILL NOT ACCEPT RETURNS OR EXCHANGES, IF THE SIZE OF THE ITEM IS CORRECT. Please read descriptions carefully and measurements of each item before placing an order. All sales are final. We do not offer exchanges, returns or refunds. What are the Domestic US shipping policies? For U.S. orders, ll items will be shipped via USPS First Class Mail with tracking and delivery confirmation. Insurance is available for an additional fee. Please contact us for pricing. If you need express shipping, please contact for pricing. What are the Canadian shipping policies? Shipments to Canada are sent via Canada Post Expedited Mail (includes Tracking) and takes 3-4 business days for delivery. Please send us a conversation to request the tracking number. What are the international shipping policies? For International Orders: All items will be shipped via DHL (10-20 business days but can take longer depending on customs in your country). All international orders come with tracking. Express International shipping (5-10 business days with tracking) is available at an additional cost, please contact for pricing prior to making your order. Orders shipping outside of the U.S. or Canada may be subject to customs duty or fees, which as the buyer, you will be responsible for. We strongly urge insurance on the package be purchased as we cannot control customs delays or the responsibility of lost or stolen packages. Since all of our products are made to order and customized based on your selections, we are unable to offer returns or exchanges. This is a very standard policy among bridal shops, and ensures that you will receive a brand new, never worn bridal accessory that has been made to your order. What if the item I received is the wrong or damaged? We will examine the damage and will contact you back. If time allows, an exchange of the item will be offered. The customer must send the item and provide a delivery confirmation number. A new item will be sent as soon as the wrong/damaged one is received. If time doesn't allow for an exchange, we will reimburse you the cost of the item after the wrong/damaged item is received. Item should be unused and in it's original package to be eligible for exchange/refund. MadeForHerCouture WILL NOT ACCEPT RETURNS, EXCHANGES OR REFUNDS FOR USED &WORN ITEM. What if I forgot to specify the right color or size? To help you create your own unique design for your accessories. MadeForHerCouture offers a range of color, sizes and style choices. While purchasing an item please choose the size, color or style from the drop down menu. If the specifications are not chosen by the customer we will contact you to confirm. If the customer does not respond within 48 hours/ 2 days. The customer will receive the item as pictured. Are jewelled or appliqué garters heavy? All garters are made with stretchy materials to ensure a secure fit. Jewelled or appliqué based garters will be heavier than flower or material based garters. I have a formula which will take in jewelled based garters the right amount to ensure the right snug fit. Please ensure your measurements are done per the listing instructions and done standing up.